Debut album, "Rush," released on their own label, Moon Records, in Canada. Import copies surface in America. Several thousand are sold in the Cleveland market alone. Mercury Records signs group and releases "Rush" in the U.S. to coincide with a debut tour. Prior to the tour, Neil Peart joins the group as drummer and soon-to-be chief lyricist. Second LP, "Fly By Night," released and Rush begins a four-month groundbreaking tour as special guest to Aerosmith and Kiss. 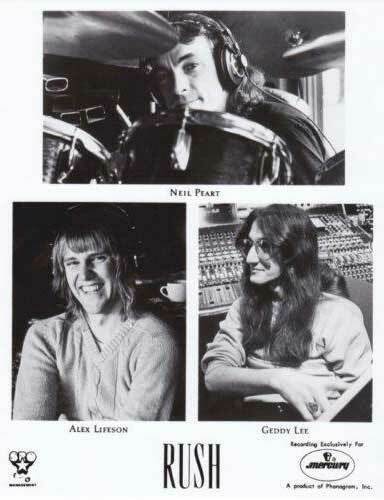 Rush receives first Juno Award (the Canadian Grammy) as Most Promising New Group of 1974. The trio commences recording their third LP, "Caress Of Steel," their first concept album. "Caress Of Steel" released. Third U.S. tour begins. "Fly By Night" is certified gold in Canada. Rush's breakthrough album in States , "2112," is issued. The title track soon becomes the group's signature piece. Group appears for three sold out nights at Massey Hall in Toronto. The shows are recorded for a live album. Rush receives gold awards in Canada for "Rush" and "Caress Of Steel." "All The World's A Stage," a live, double album, is issued. First tour of England and Europe to excellent response. "A Farewell To Kings" issued, the most adventuresome Rush LP to date. The by now obligatory U.S. tour commences. Three Rush albums are certified gold on the same days in the United States: "2112 ," "All The World' s A Stage," and "A Farewell To Kings." A 16-date tour of England sells out two months in advance. "Archives," a package including the first three Rush albums is released in the U.S., Canada, and England. Rush draws well over one million people on their "A Farewell To Kings" world tour. Rush receives second Juno Award, this time for Best Group of the Year. The band at this point has six gold and three platinum albums in Canada. "Hemispheres," featuring the side-long title track, is released. Rush scores their fourth gold LP in the States with "Hemispheres." The group also sells out three nights at Maple Leaf Gardens in Toronto, setting an indoor Canadian attendance record. Rush wins second consecutive Juno Award as Best Group of the Year. The group commences a six-week, sold out European tour. During one of their five London dates, Rush is presented with a silver disc award for British sales of "A Farewell To Kings." For the first time in five years , Rush takes a substantial vacation. However, they still begin writing material for the next LP. As a special "thank you" to their British fans, Rush does two isolated British dates, drawing over 20,000 and turning away thousands more.